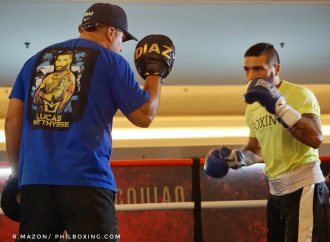 KUALA LUMPUR - Lucas Matthysse sat comfortably as his trainer Joel Diaz wrapped his hands in a hot basement turned gym of the Le Meridien hotel in the center of this bustling city. The thermometer hit 86 degrees Fahrenheit or 30 degrees Celsius Wednesday morning but the current WBA (World Boxing Association) welterweight champion is calm and cool as it got hotter in the gym by the throng of media men that surrounded him for a picture and an interview. “This right here is cold compared to where we trained. We trained in California, in Palm Springs for this camp. Right now, Palm Springs is a hundred sixteen to a hundred and twenty degrees,” Diaz explained. The humidity may be beneficial to a fighter approaching the scales as it may aid him in losing extra poundage but Diaz mentioned that weight is not one of the camp’s concern against this super fight with Manny Pacquiao on Sunday. “Lucas’ weight probably right now is at 149 (pounds). He’s only like a couple of pounds over. He’s been like that for the last couple of weeks. It’s never been an issue,” Diaz added. Matthysse’s early arrival in Malaysia helped him get acclimated to a new city after a long flight from California but he has adjusted well to the time difference and the Malaysian heat. “It took me a couple of days. But now, I am resting really well and even with the weather and the heat, I am comfortable now.” Matthysse stated through Diaz who also acted as his translator during Wednesday’s media meeting. Asked by a member of the media if he is ready to go to war against Pacquiao, the current 147 champ nodded and said yes. “He slept so well, he woke up at 10 o’clock in the morning. So he’s just relaxed, he has peace of mind. He’s ready," said Golden Boy Promotions’ Ramiro Gonzales. Lucas Matthysse is relaxed and ready and that is good news for his handlers as he prepares to defend his title against the legendary Asian fighter. Photo: Lucas Matthysse does the mitts with his trainer Joel Diaz in Kuala Lumpur Wednesday.